Could there be a nicer name for a store ? Do No Harm – they provide natural products, that are both good for you and cruelty free. As a huge fan of natural products I have always felt very drawn to this store ! Do No Harms Ethos fits in beautifully with mine and I am so happy to be able to share with you these products and my experience with them! 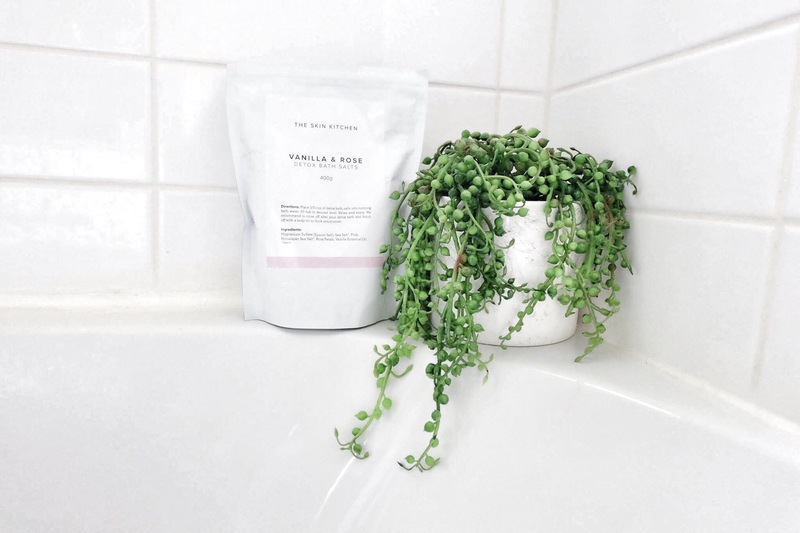 This pretty wee package here is The Skin Kitchen Vanilla and Rose Detox Bath Salts, I opened them and was truly amazed at the DIVINE smell that instantly came from the packet. I have had one long soak with these in my bath and it was a memorable experience! Plus anything that is a Detox is high on my list of priority currently, as my body is currently being cleansed and looked after again by me after a couple of years of it being pregnant and raising very small babies! I am taking time out for me again and it feels incredibly good ! I have never felt overly comfortable using normal tampons. Because of all of the research I have done I know about the lurking nasties in regular Tampons! I have had washable pads in the past but I never felt comfortable or 100% protected using them either. BON 100% Certified Organic Tampons are are produced without the use of chemical fertilizers, herbicides, insecticides or fungicides. So are truly kind to you and to the earth. And they are a product that works ! I wont go into masses of detail – but I can personally recommend them ! Now this is a product that already has been used multiple times this here is Millstream Gardens Arnica Ointment !!! I LOVE Arnica!! I almost named my eldest daughter Arnica as I love the word/name very much! I also took arnica after my son Beck’s birth and I believe my recovery physically was aided by consuming it in oral form. Every time Cora or Beck have fallen or hit their knees or head in the last couple of weeks this has been applied with a cuddle and kiss and it makes everything better as it is an anti inflammatory ointment that helps to ease sprains, strained muscles and bruises. Take a look around the webstore – there is some brands that were completely new to me, small boutique NZ based brands mostly with the focus being on Natural, Cruelty Free Goods. I am a firm believer in supporting small businesses – especially ones whose beliefs and actions are one in the same. I personally have been using the Safeshopper Cruelty Free NZ app (it is free and easy to use) – and use it whilst shopping, it is easy as my phone is always with me and I can double check the products that I am unsure about. I am not trying to push my values and ethics on to others I however am very keen to raise awareness of things that I am passionate about and believe in. Are you ok with animal cruelty? (I think when actually faced with the enormity of that question 98% of humans are not ok with vivisection and animal testing!) Sooooooo lets keep an eye on how we spend our money as that is what will help bring about change in a consumer driven world.